Hello humans! Odrajux is finished! 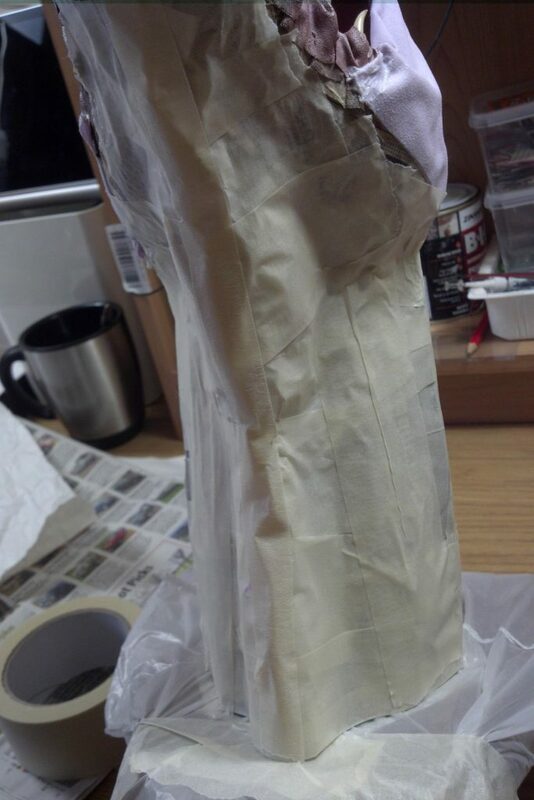 In this post I’ll just quickly show you the process of painting him, but I’ll be taking proper pictures soon to show you. Odrajux has been the dragon that’s taken me the longest time to paint so far. I tried a different approach: instead of painting with “bright” colours and then black-washing to add depth, this time I went for a very dark base and slowly added layers of lighter tones until it was just right. This is true for the red/brown areas of the dragon though. I still black-washed the neck plates and chin. 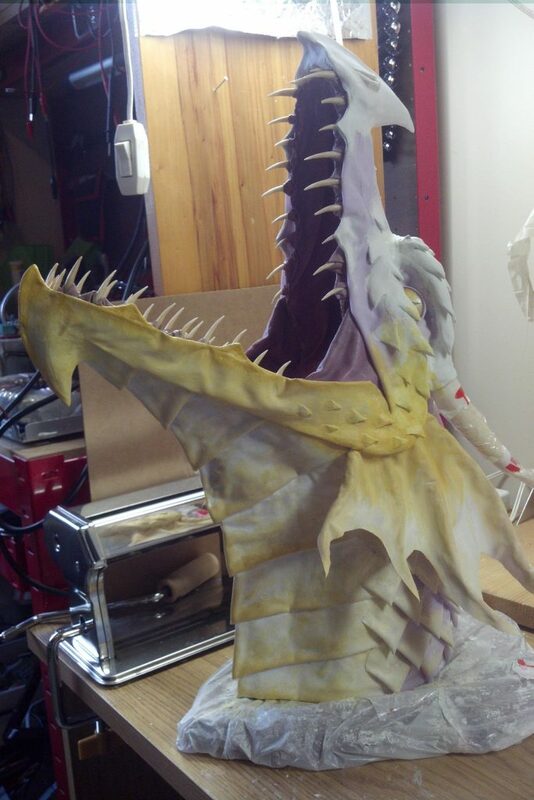 So I decided to start with the lighter colours: white and ochres, and then gave the rest of the dragon an umber coat. It looked pretty good already! 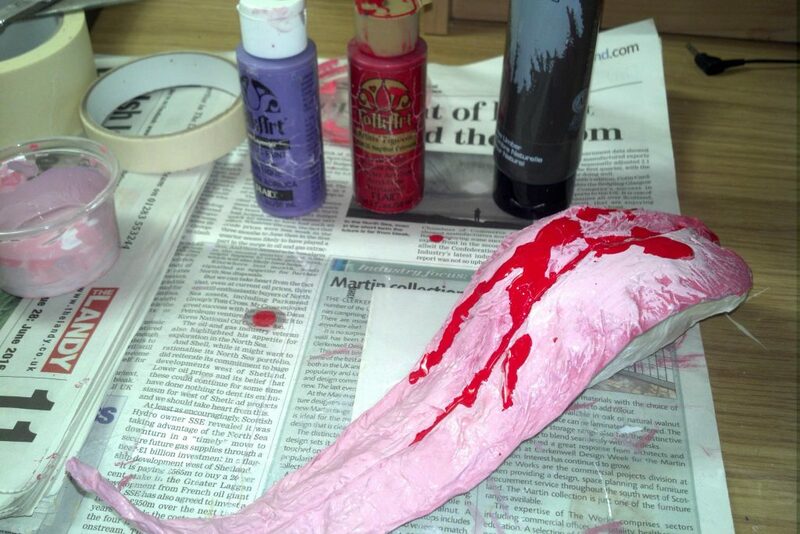 Once dry, I started giving it layers of plain red. Loads of layers. Even more than you think. But eventually, it became opaque enough to look red. Time consuming as it was, this actually gave the whole thing a lot of depth. I also blended in a tiny bit of blue and sienna here and there to add to the richness. Once the colours were pretty solid (that would be the last picture), I proceeded to black wash the lower neck, and then I worked on dry-brushing all of the details, highlights and shadows. Again, this took quite a bit of time due to drying times (using that much retarding medium didn’t help! ), but it looked great in the end. Also, I used significantly more paint than usual, but it looks pretty nice. I’m not showing any pictures of the finished thing on this post, but I will soon! Stay tuned! 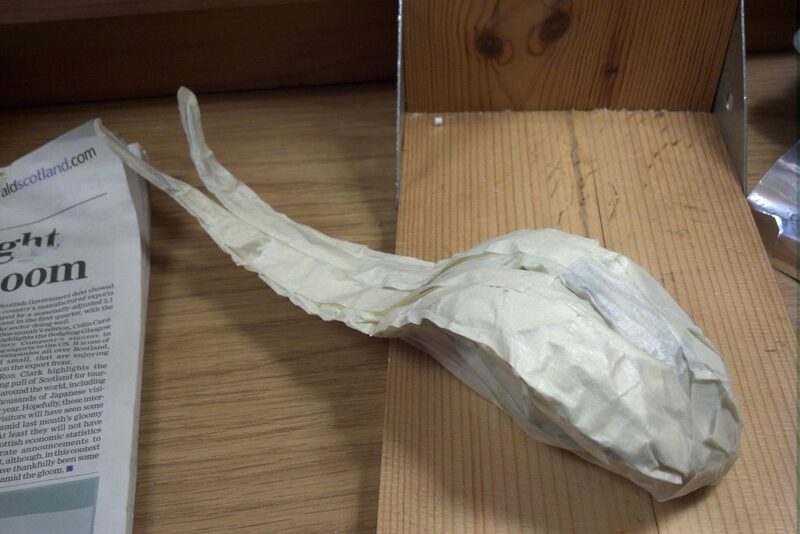 Have you ever left some masking tape taped onto something and came back after a month? 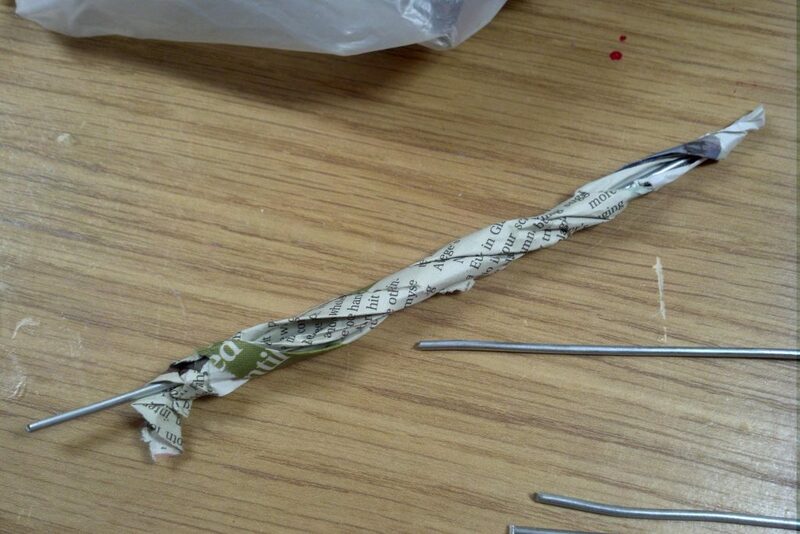 I’ll tell you what happens… it unsticks and curls on itself! Poor Odrajux was in the coveredinmaskingtape state when I left him. When I came back from my trip he looked like an unrecognisable party mummy. 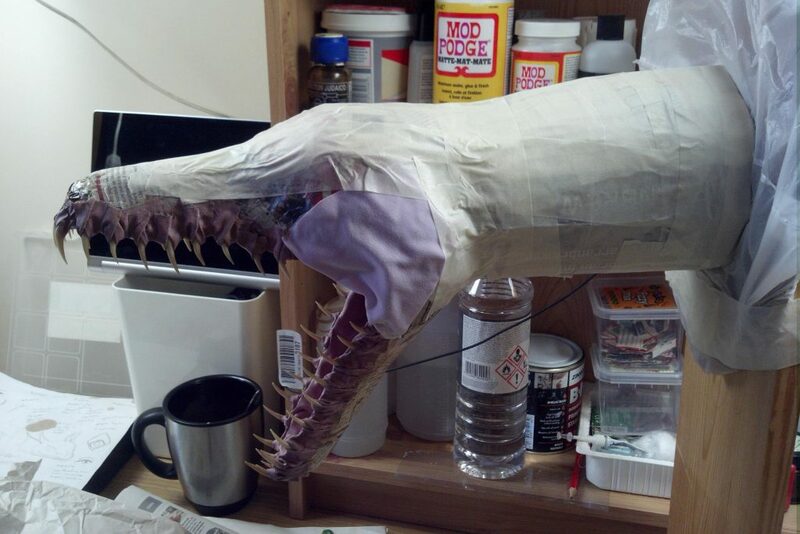 So after making the new tongue, I gave him a nice coat of paper mache to get the tape back where it was meant to be stuck. I just used kitchen roll for that. Right. So I know a number of you has been concerned about how “shoddy” his face looks, since at this stage with the other trophies I’ve shown in the past, their faces look a lot more neat and complete. The thing is, I’ve been experimenting with a different process, because I find that using only cloth for the face is not only very time-consuming, but it’s also difficult to get right, since I like to cut only a few big chunks of the perfect shape to fit large surfaces (as opposed of using a lot more smaller pieces that would look a lot worse). By doing this, I waste a lot of time and cloth, and it’s not very customisable anyway. 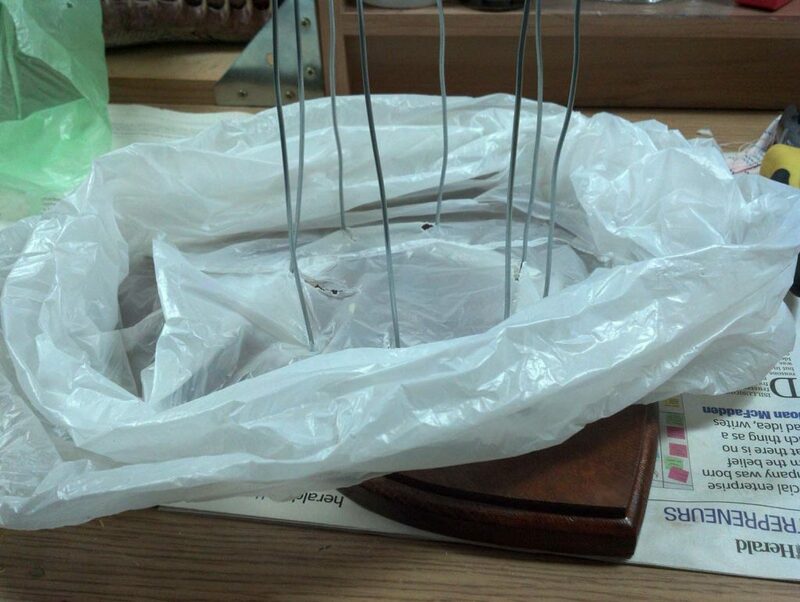 So this time, I got myself some paper pulp and more Das clay. I know exactly what I want to do, so we will see if it works or not. 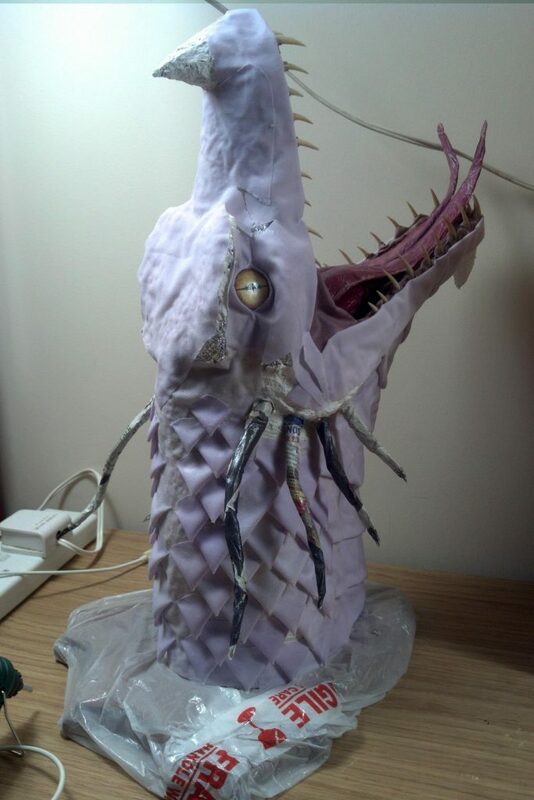 I’ll show you what I’ve done so far, which is adding some structure with aluminium foil and paper pulp paste, covering some areas with cloth, and adding the neck scales. 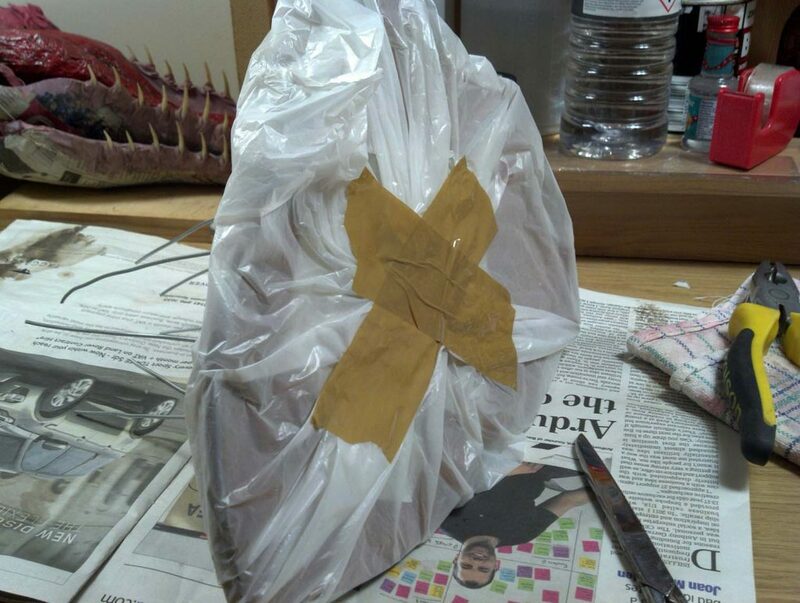 I found that covering aluminium with paper pulp helped a whole lot, since fabric mache sticks to the paper paste and not to the aluminium foil, which is often problematic. Also, I can smooth out the texture so the texture of the fabric looks smooth instead of having lots of tiny spikes and bumps. It’s a bit more costly, but I think it’s totally worth it, so I will probably keep on doing this kind of thing this way. 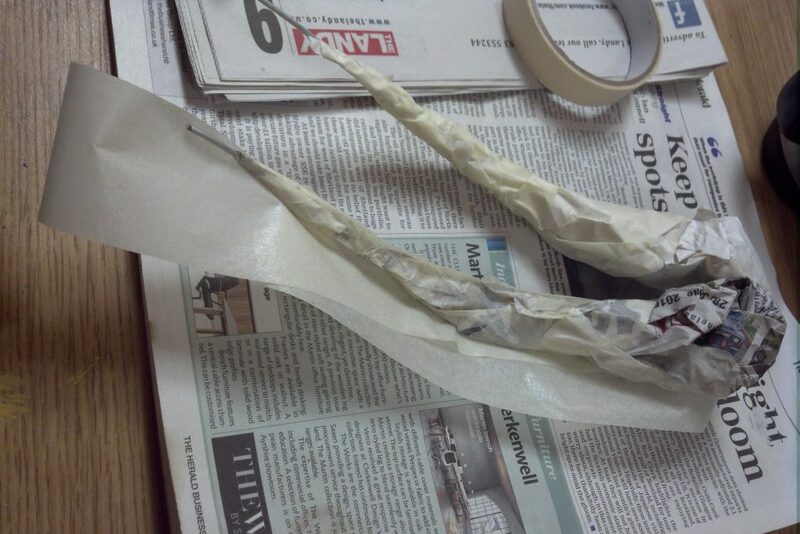 Now the only things missing before adding the horns and the clay are the cheeks and the membranes. You’ll be seeing that soon though! So, jaws were done. Tongue was done. 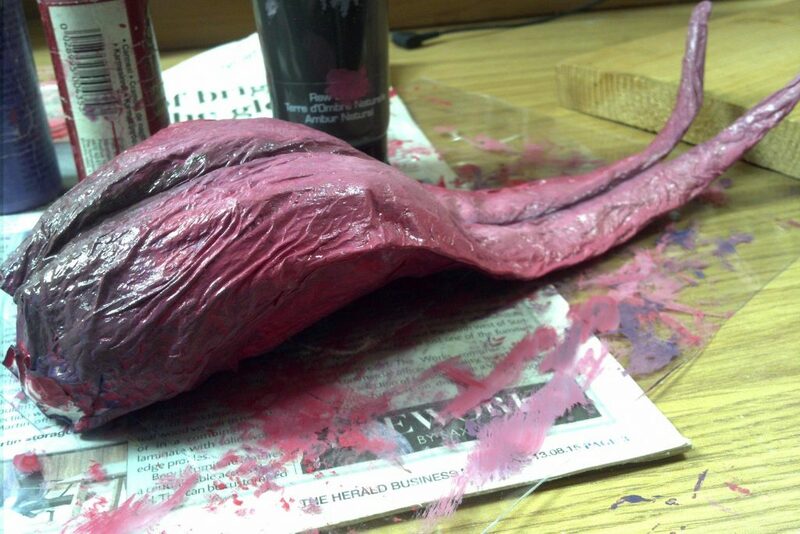 I tried putting the tongue I made a while back in the mouth… and it looked awful. I realised how ill-fitting that tongue was for someone like Odrajux. The old one was a thick, round slab of flesh. 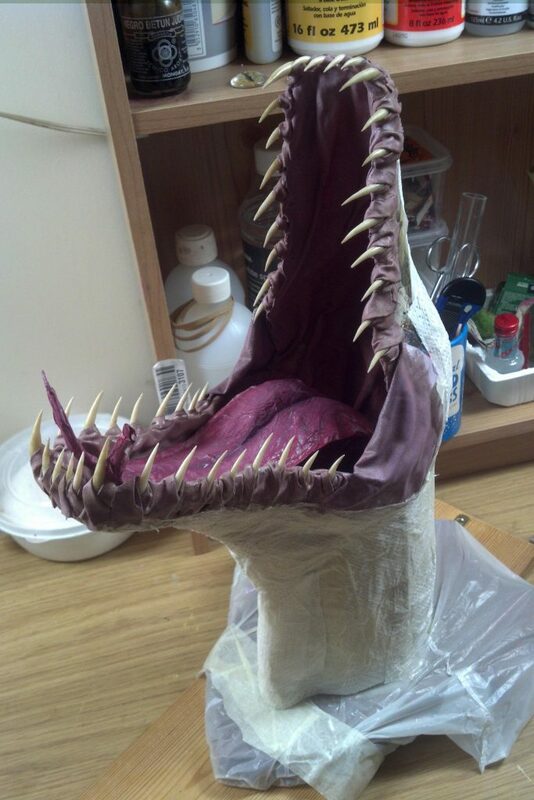 But what this mouth needed was something more vipery, more aggressive. Made to frighten, not to speak. And thus, I decided to redo it! For the new tongue, I used the same technique as usual, but made it look quite different. I took plenty of pictures for you to check out, including the colouring process. 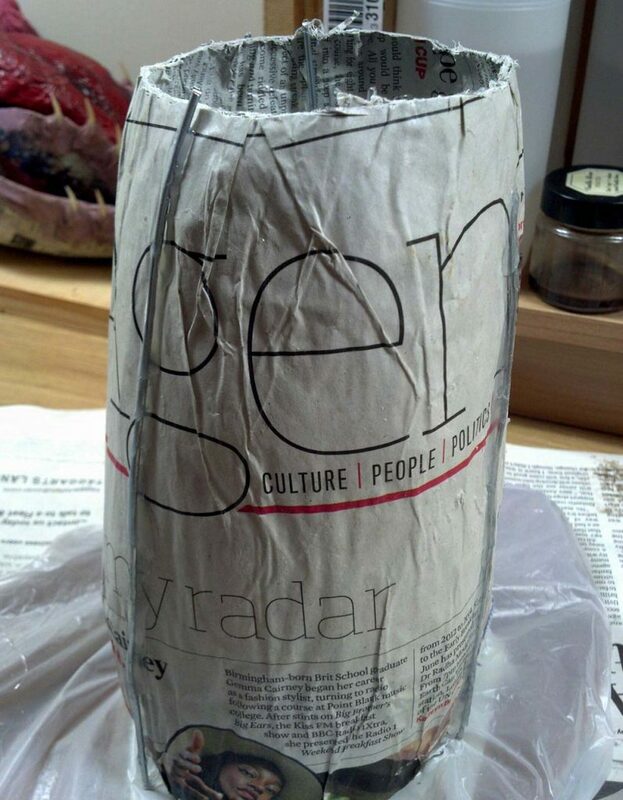 These photos are pretty self-explanatory, but to summarise, basically what I did was shape some newspaper into long cones and attached them to some steel wire. 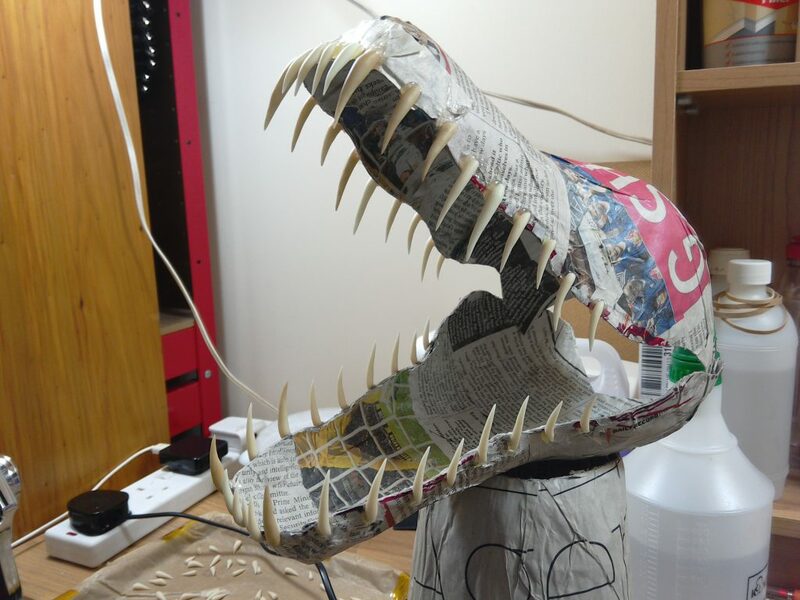 Then, I gave the mouth a bit more shape with more newspaper and more tape before covering everything in paper mache. I used a special kind of kitchen roll that has little bumps on it that look like taste buds (I’ve told you about it before). It looks really nice! Once dried, I painted it with acrylics. As you can see in the pictures, I like to adjust the colour on the spot, by squirting more paint on the piece while it’s still wet. 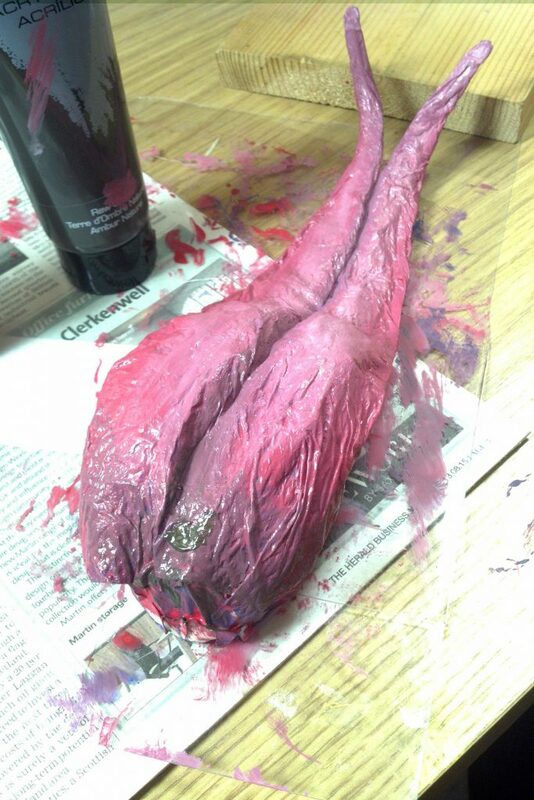 In the end, I gave it a purplish-dark-brown wash and also a glossy varnish. If you have any questions, do ask! I can’t wait to show you the whole thing put together, it looks pretty amazing. Hello folks! It’s been a while. I’m back now though, and things are going back to normal, so expect regular updates once again. 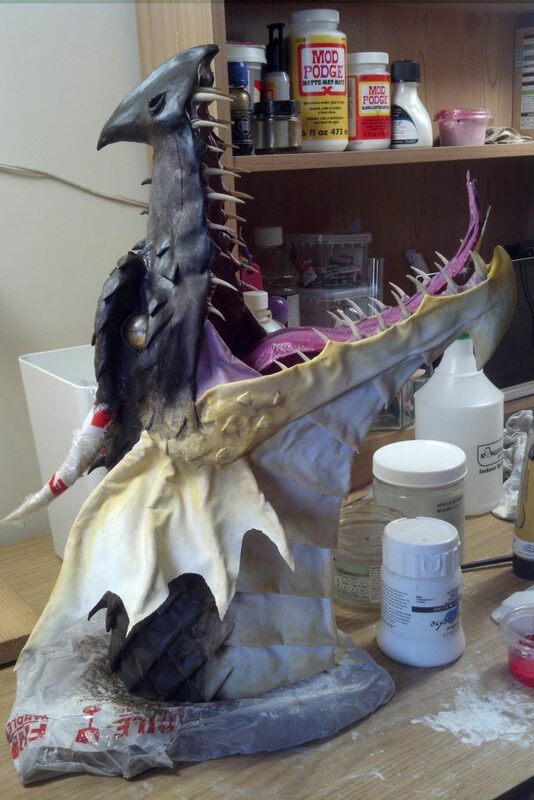 Today I’m just making a quick post to show you some pictures of the progress I’ve made on the fearsome Odrajux. One a side note, Anachromie has been sold! She was a labour of love and I will miss her… but that’s the way it goes. Humans are obsessed with measuring time. Which is understandable, since their lifespan is so short. Some people’s lives more so than others, revolve around the clock. Jobs are extremely important for humans, as this gives them the currency they need to purchase their food and other basic (and not so basic) needed items and services. Because of this, sometimes people will take their jobs too far, to the point of becoming unhealthy and/or miserable. Something that puzzles me is that even though they complain about this kind of situation, they completely accept it, and I think you would agree with me if I said that it’s a very normal occurrence nowadays. Sometimes, working too much can break a family, but at the same time, a family can not subsist without paid work (at least in what “we” call “first world countries”). What a cruel irony, isn’t it? How did this come to happen, I wonder? I read somewhere a few days ago, that people used to work an average of 4 or 5 hours a week before the Industrial Revolution, but because of the changes that non-human labour (machines) brought, workers ended up “enslaved” to their jobs after complaining too much about the lack of work. Now, I don’t know if this is true or not, but however it came to happen, the truth is that average work hours have increased a lot over the course of a century. I wonder how far this will have to go for the working class to rise up and change things again. This seems to happen from time to time, after being pushed for too long by higher powers. Even though the system that is currently in use (Gregorian calendar) is almost 500 years old, very inaccurate, its quarters are not equal, it doesn’t follow Nature’s rhythms, months have different lengths, weeks always start in different days that are hard to guess, and a long etcetera, most people still use it to measure time. Why? I believe it’s because humans are creatures of habit. They love their comfort zone, traditions and resist change. Am I wrong? Maybe. Do you have your own opinion? Of course you do, and I would love to hear it in the comments. Now, down to business! I hope you all enjoyed your holidays. I sure enjoyed mine! I love the liveliness of the Christmas period: carols playing in the background, so many colourful lights, people everywhere… It’s the perfect time to mingle with humans and learn about their culture customs! Anyway, I took a little break -as many of you did-, so I made little progress on Odrajux, but I took the chance to take a lot of pictures and share the steps to prepare the shield more in-depth. 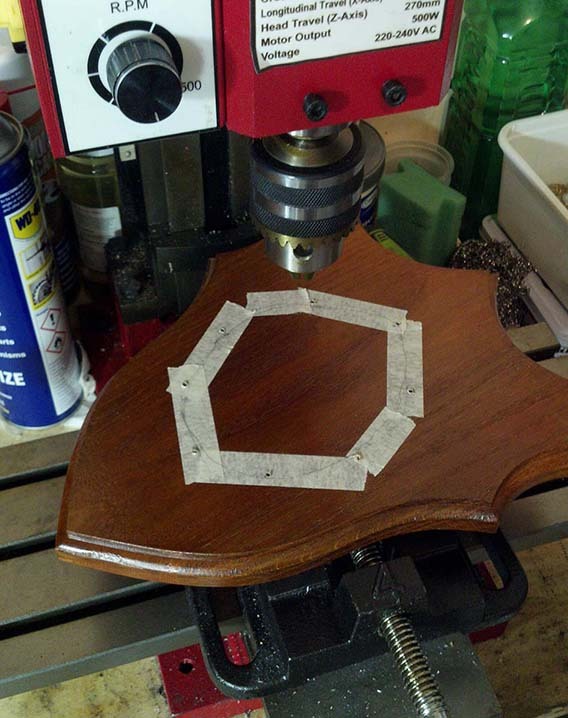 When the holes are ready, I sand down any imperfections and proceed to cut some pieces of steel wire twice the length of the neck plus a few inches. If for whatever reason the dragon will need extra support (heavy horns, very open mouth, etc), I make them even longer and add them as support for the head and not just the neck. 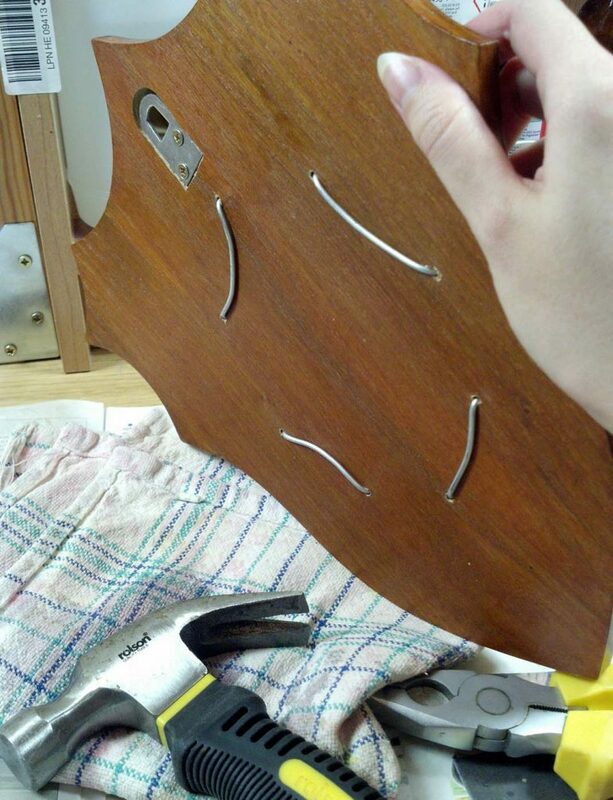 Because I drilled eight holes, I only needed four pieces of wire, which I bend into place and then hammer them flat against the shield. I put some masking tape on the wire to avoid damaging surfaces. The next step is to protect the shield. 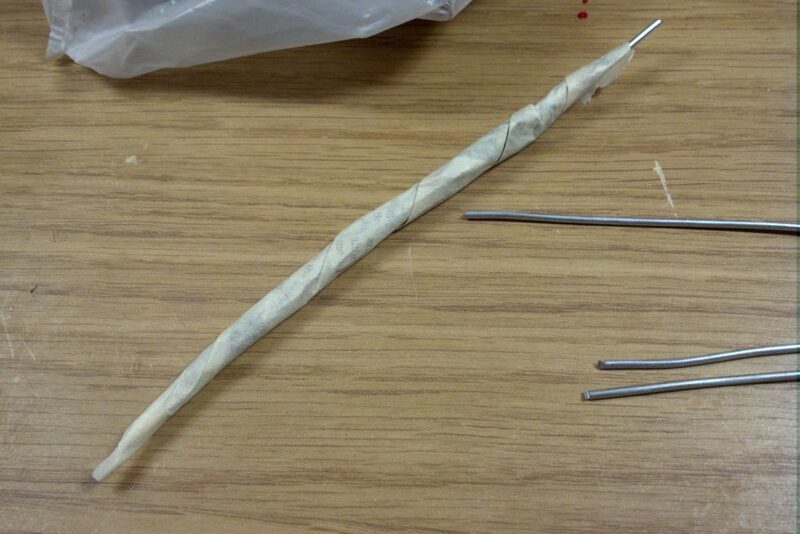 I do this by simply wrapping it in plastic. 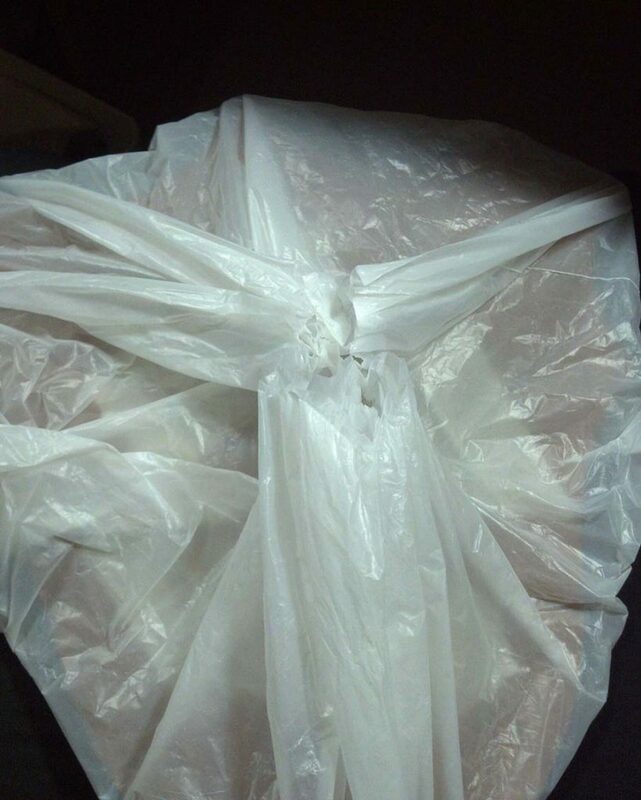 I normally use a thick, above-average quality carrier bag that won’t break easily, and stick it right into the sharp wire all the way to the base. 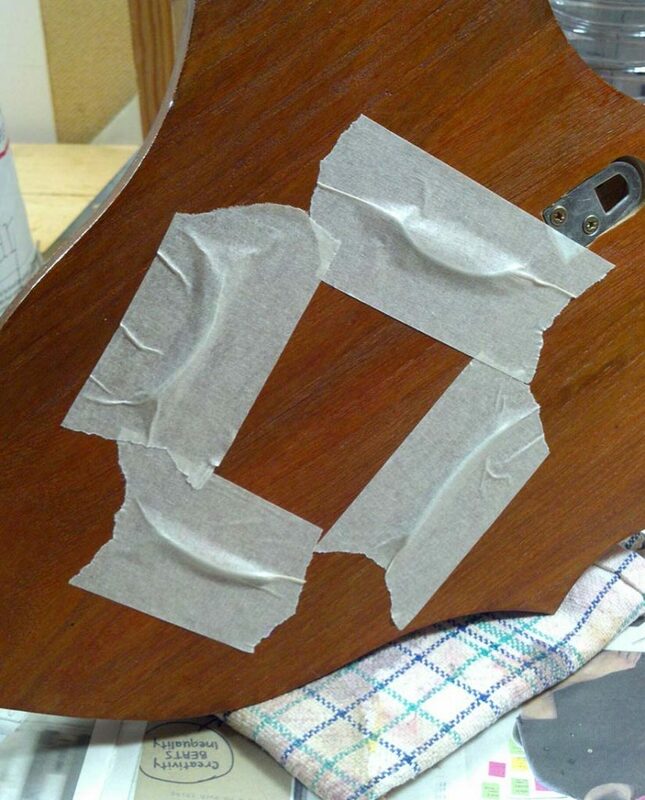 Then I simply turn it over, cut the excess plastic and tape it together. Quite simple, really. 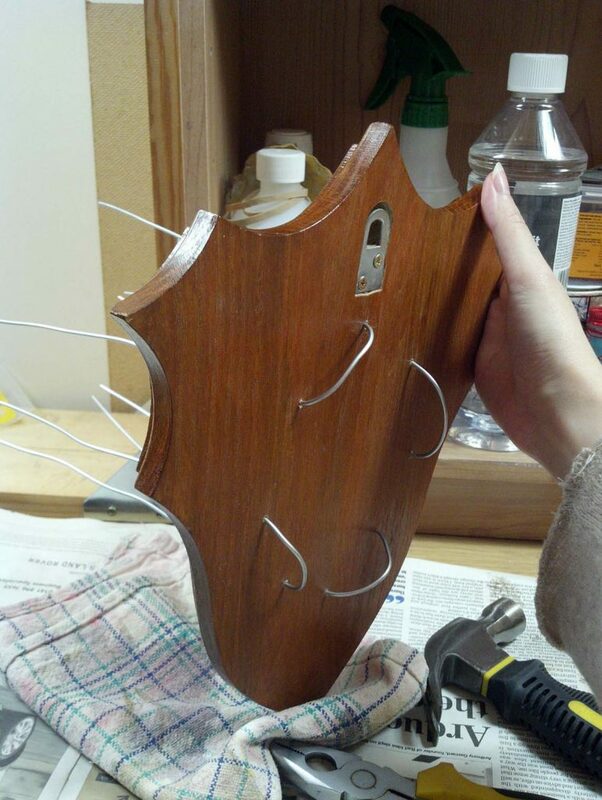 Once this is done, I stick the neck piece in and secure it to the wire with a lot of hot glue and tape. 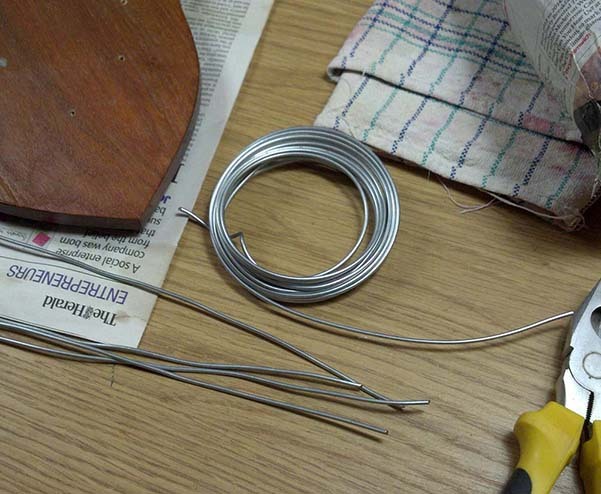 In this case, I decided to leave four wires outside and four inside of the neck, but this varies depending on the design. 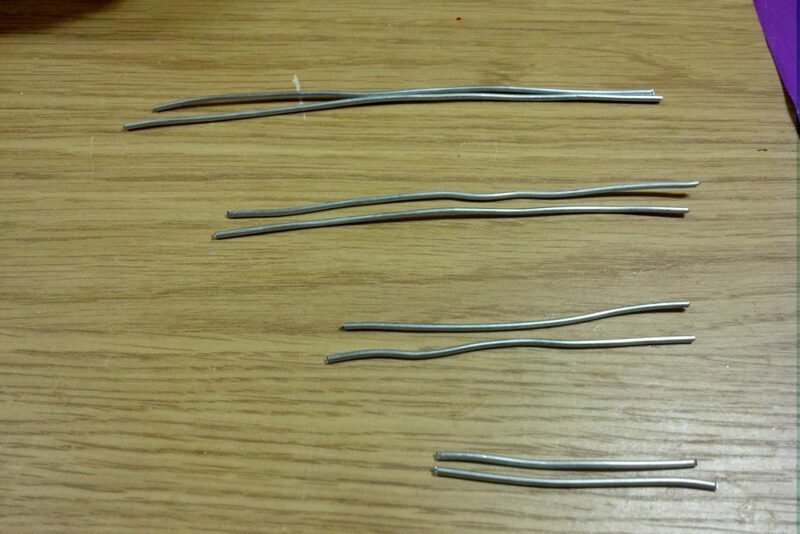 For example, when making Kaltakess, I made 10 holes/5 wire pieces and left them all outside. I did this to give a sort of like vein/muscle 3D effect to the neck, all the way up to the “ears”. I hope you enjoyed this detailed tutorial, and remember to let me know what you think about time measurement and jobs (if you want). The Arcane Dragonry now on Etsy! Time for celebration! Now only because of the holiday season, but also because The Arcane Dragonry just opened a shop on Etsy! Etsy (as well as Paypal) offers a very safe and controlled environment where you, your money and your purchases are covered, in case something goes terribly wrong, so it’s perfect for those of you who are extra wary of buying things on this amazing thing we call the Internet. If you’ve been reading my posts, you know that I’ve been working on another project as I worked on the last stages on Anachromie. 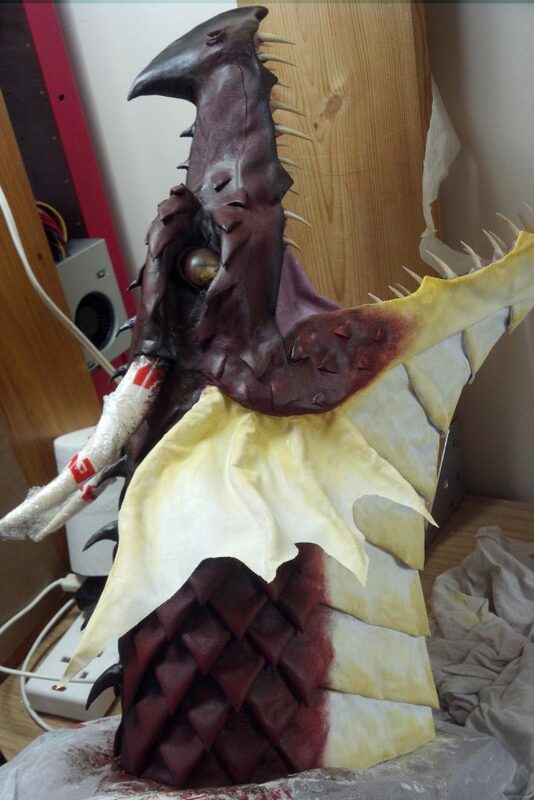 This other project is a red dragon called Odrajux. Now, this is a figure of renown from Abeir-Toril (my homeland). He existed long before my time so I never met him, but it’s written that he was vicious and feral when young. When he became large enough, he took off to never return. We know of him from the tales of terror from the north, where apparently he became the scourge of (mostly) human villages for centuries. He was eventually defeated in an epic battle by a large group of seasoned mercenaries. However, he became a legend that’s been immortalised in books and still lives in folklore up to this day. Now, since I haven’t really posted any progress on Odrajux, this is going to be a long post. You’ve been warned! Easy, right? Right. Feel free to ask any questions if you do have them! Anyway. Odrajux was quite the horned dragon. 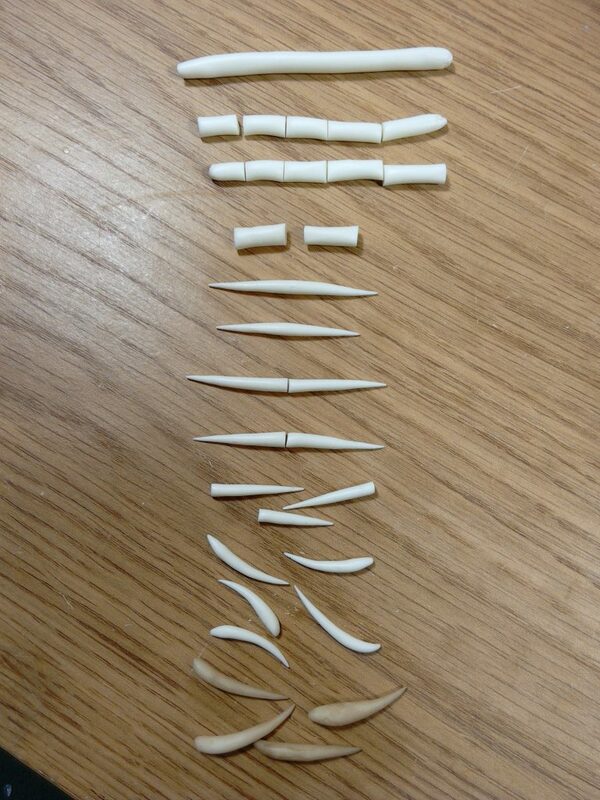 And so I had to make quite a few horns and spikes. I hope it’ll be enough! 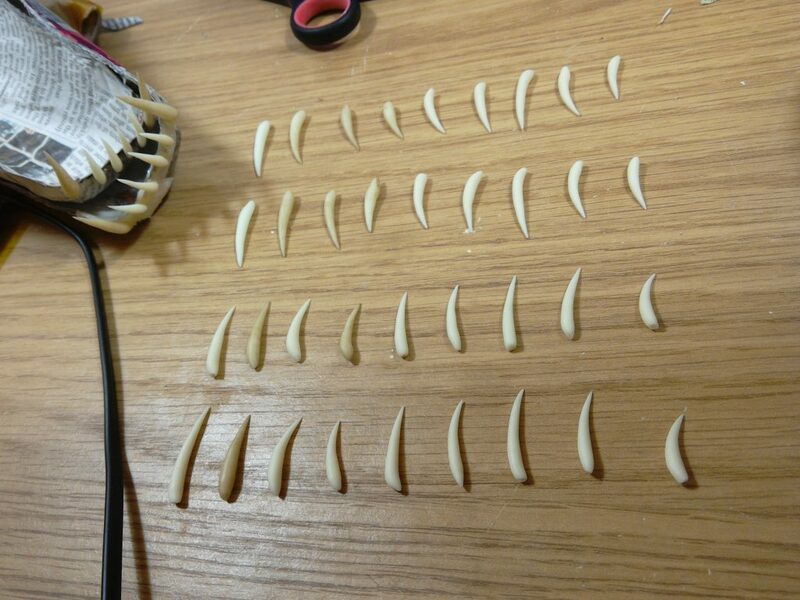 I also made enough teeth for next time. I wanted to make his mouth VERY menacing, so I used very long and sharp teeth glued close together. Down below you can see the layout before I glued them in. Now, I’m sorry I forgot to take pictures between those two steps. Sometimes I get sooo into it, I forget to do things! Also, my work space was turned into a makeshift photography studio for two days in order to take “proper” pictures of Anachromie… which was a nightmare, but I already complained about that on the last post, so I won’t elaborate. To make these jaws I used the same technique as usual (which I’ve wrongly failed to mention in the past) has been defined by the great artist Dan Reeder and it’s one of his most wonderful additions to the “cloth mache” world. He is a great person, as well as a great artist, and as I mentioned while making Kaltakess, he’s been my inspiration to make these trophies. 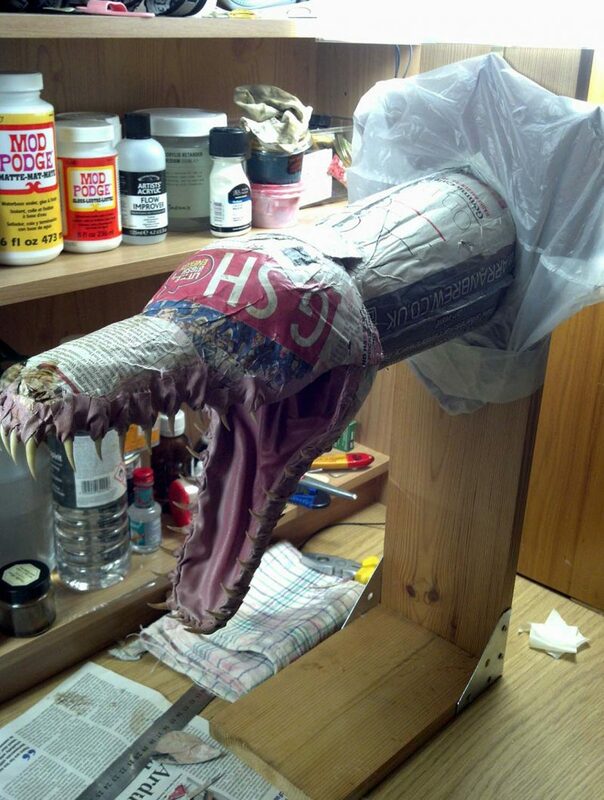 I highly recommend his book “Paper Mache Dragons” (which I proudly own). There, he explains how to make dragons in a lot more detail than I provide, and much of the initial process you see here on my website like hollowing paper mache shapes, attaching the piece to a wooden shield, making the jaws and creating skin/scales with cloth, have been taken from this book. 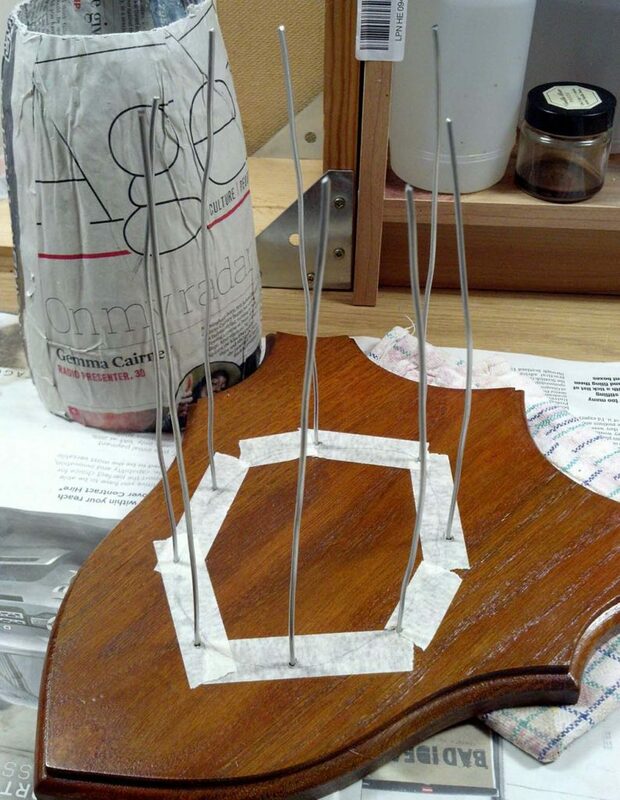 For now, I am bound to make head trophies due to space restrictions, but hopefully that will change in the future. 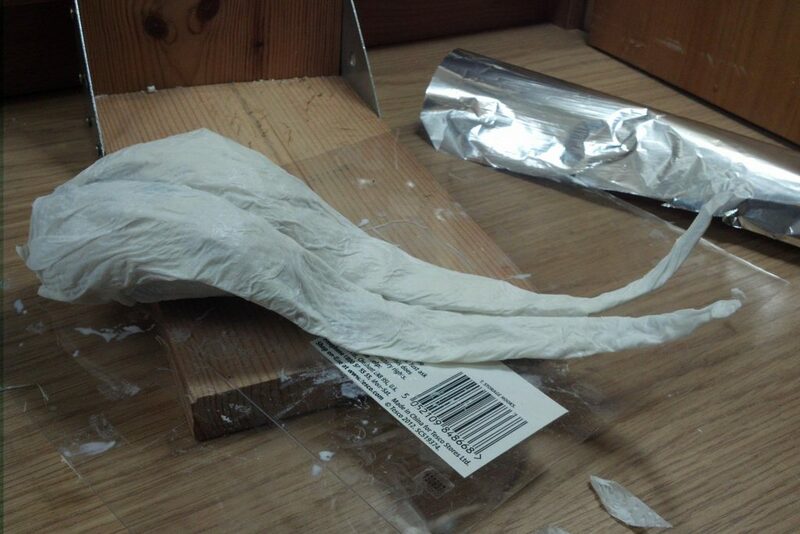 I can’t wait to try and make full-bodied dragons! 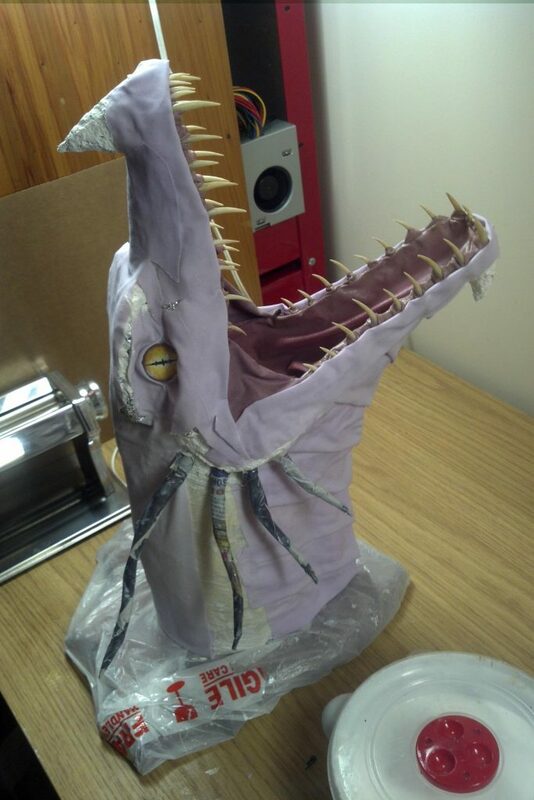 Anyway, to summarise, to make the mouth, I hot glued the teeth to the paper mache pieces. 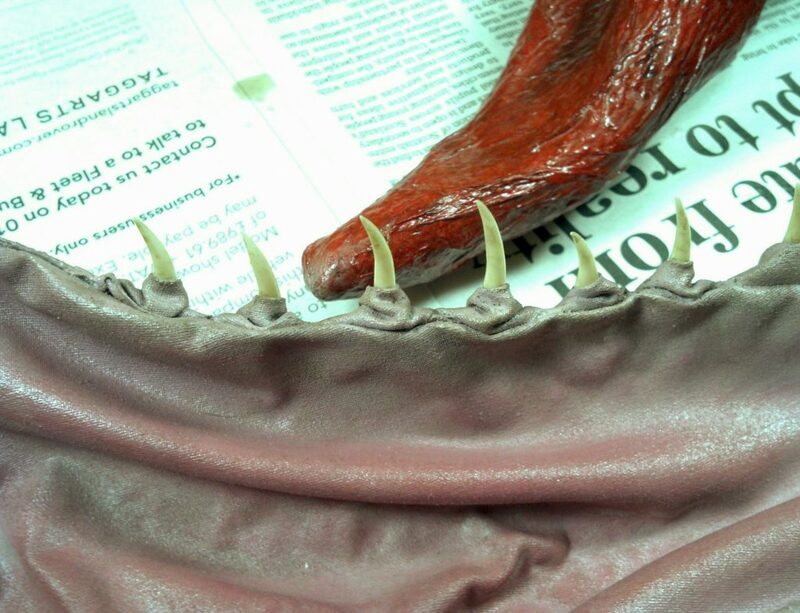 Then, I used small strips of plain cotton dipped in PVA glue to “hug” each tooth tightly, and laid out the inside loosely with a large piece of gluey fabric (is that even word?!). 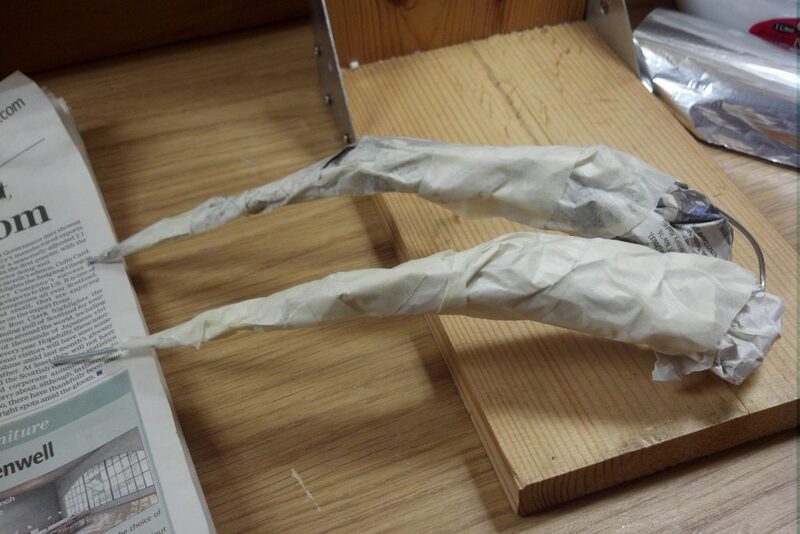 I must admit, lately I’ve been using an awful lot of super glue. 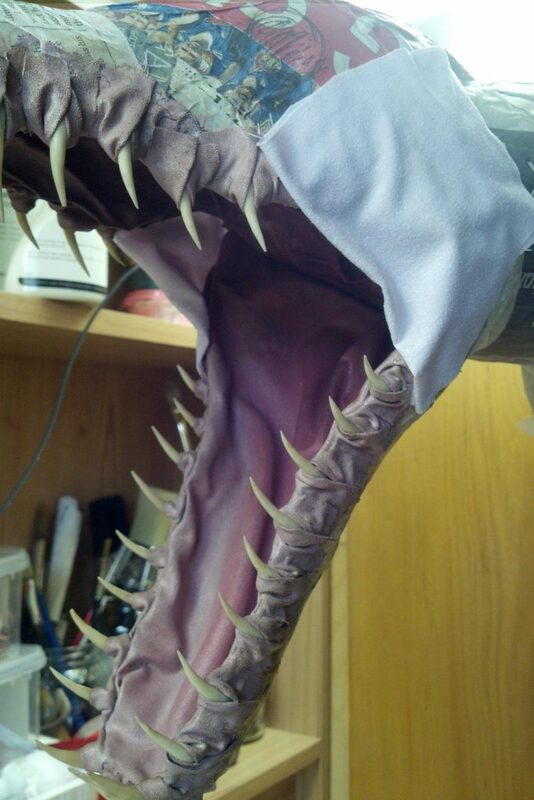 If you look closely, you will notice that the cloth that goes inside of the mouth pieces is folded on most of the ends. 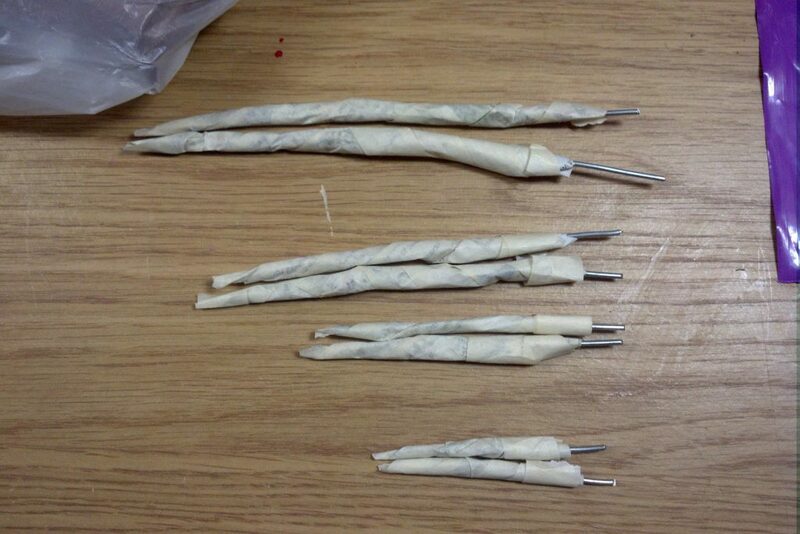 I don’t just lay it on top the “gums”, I’ve found that I quite like the folded look better. It makes for a more natural transition between all those dozens of different pieces of fabric (that are folded as well). 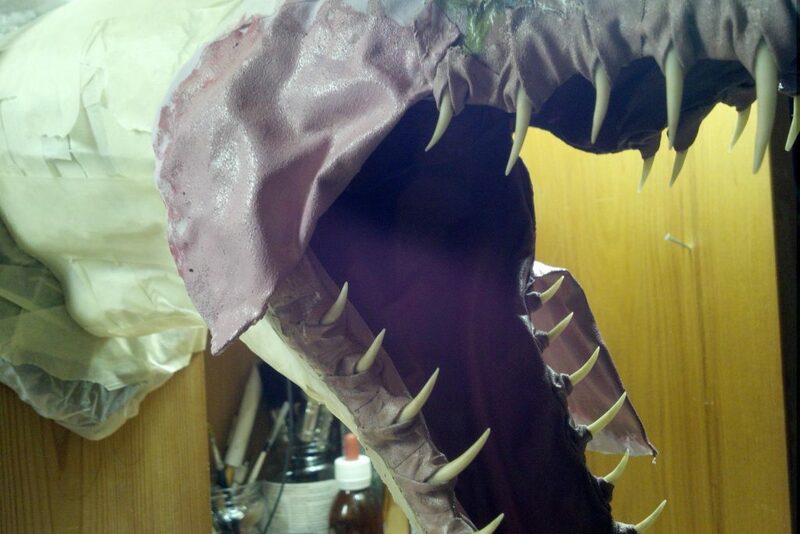 The trick to make it look so good, is to use a drop of super glue on each of the “sockets” between the teeth. I’m sorry I didn’t illustrate this process better. I will try my best to remember next time. To make the tongue, I just shaped some brown paper until it had the shape I wanted, and secured it with some masking tape. 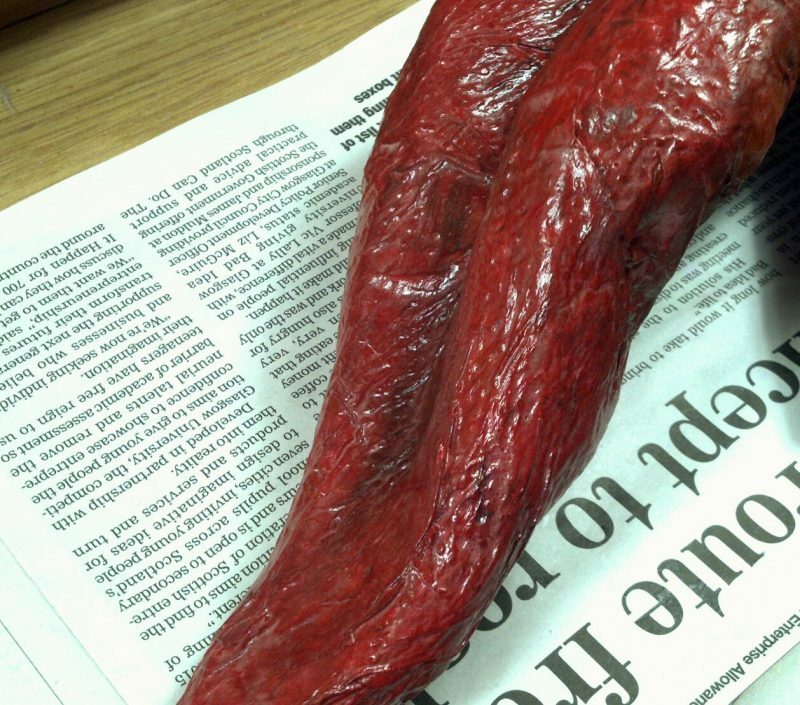 Then, to give it texture, I just paper-mache’d some upside-down pieces of kitchen roll that have little bumps that resemble a real tongue quite well. Sounds strange, I know, but check the picture below to see what I mean. Does it not look good? 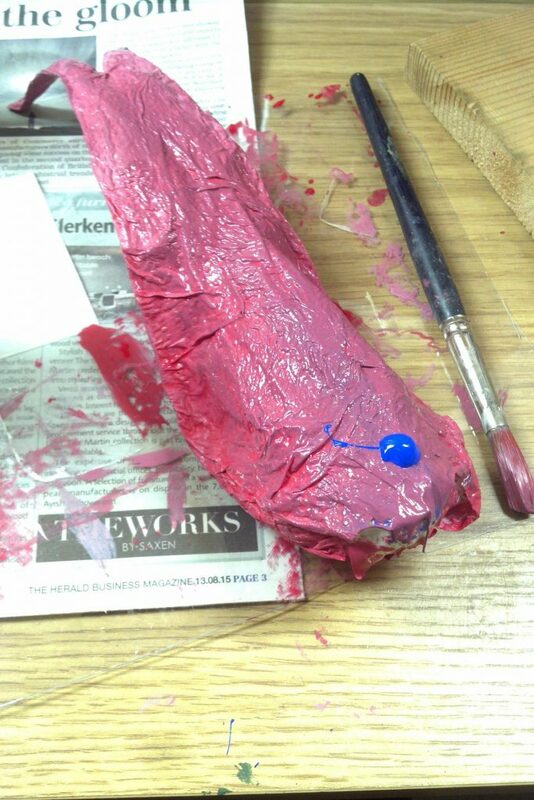 For the paint, I used a dark tone of red and umber for the tongue, and a mix of red, purple and a lot of light grey. Adding grey to a colour is an easy way of making the colour a lot less saturated and more natural-looking, so you don’t have to paint-wash it too much later to make it look better. 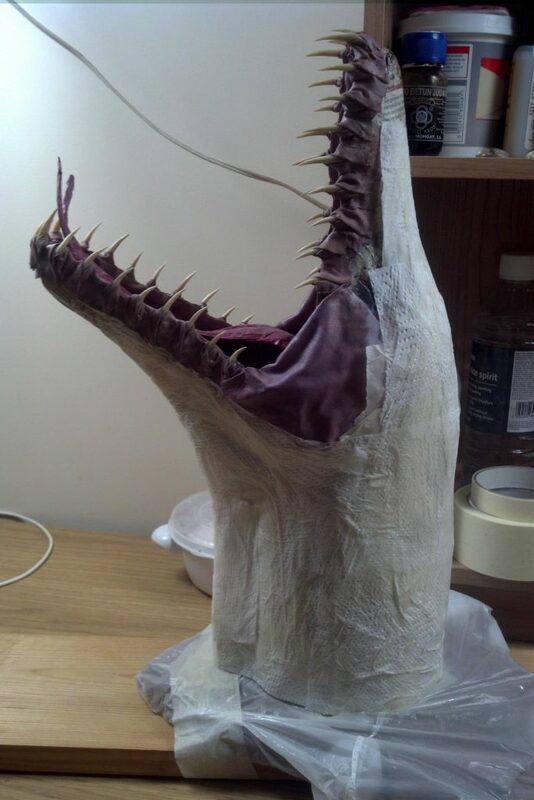 Once dried, I gave everything (including the teeth) a black wash with Bitumen of Judea in different concentrations to highlight or darken areas. 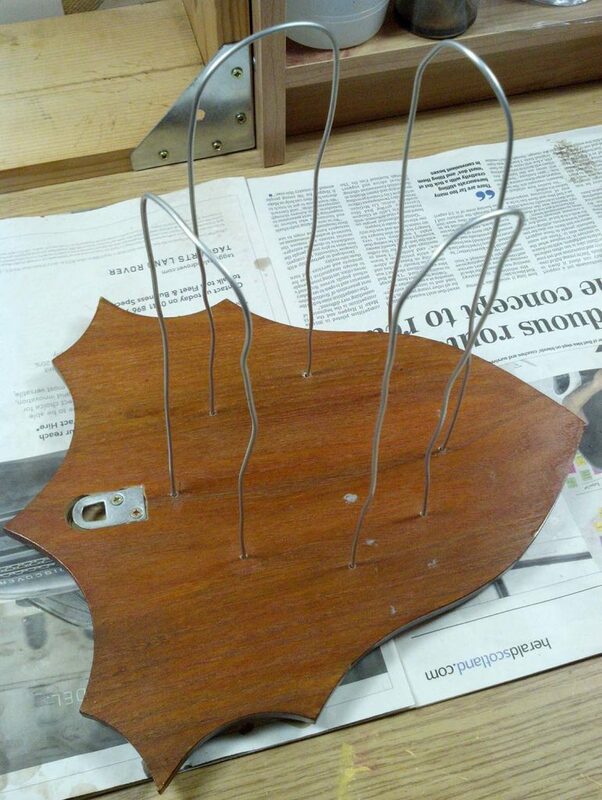 After this, I simply gave everything a glossy varnish finish (two coats on the tongue to make it extra shiny). Gloss is the cheap, modest way to make something look wet. To accentuate this, what I do is using a brush with long bristles. I dip it in water and then dip it in a glossy sealer (Mod Podge in this case), and apply it in a chaotic fashion while the brush is in a very low angle, so there’s a lot of friction with the surface. Because the texture is irregular and full of folds, it makes the watery sealer bubbly, and guess what? The bubbles don’t go away. 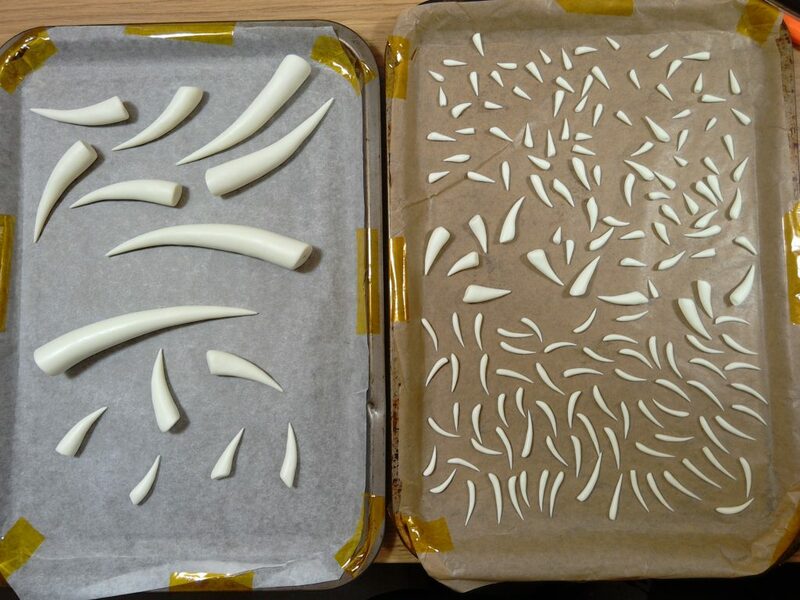 Instead, they dry as they are, so it looks like saliva. 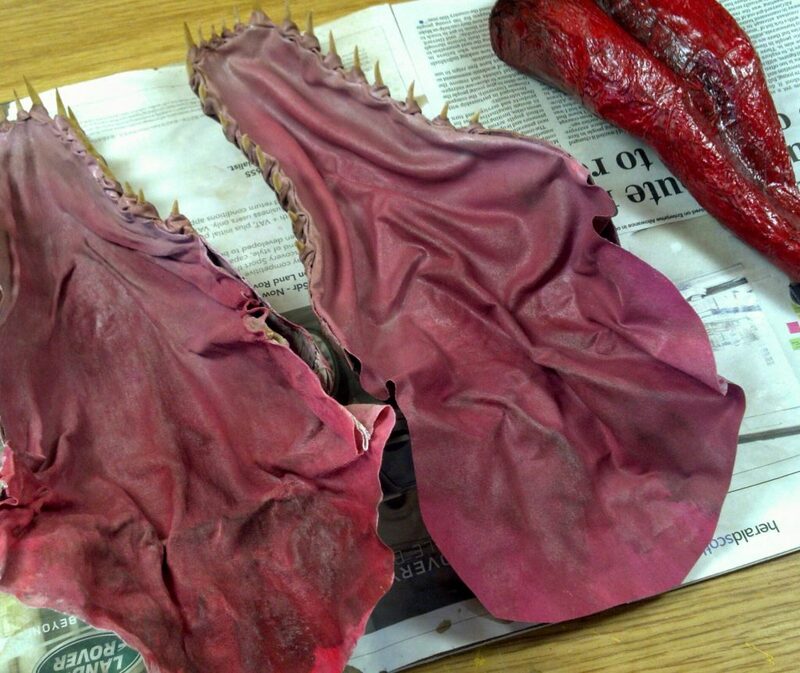 Also, the parts that have a bit more glue dry up to be a bit whitish, which also resembles saliva. I know it’s not very noticeable in the picture, but trust me, it works and it’s visible. For me, this is wet enough. 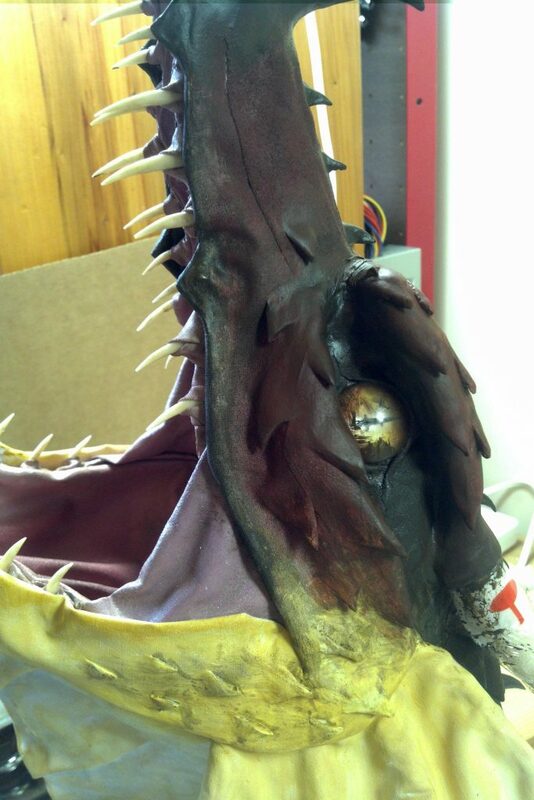 If you want to make your dragon’s mouth VERY wet and drooly, you could just use clear liquid resin/epoxy. I’ve been thinking about using this on Odrajux, since he’s so vicious and scary, but we will see. I don’t particularly like drooly things or beings in general. I find them almost revolting. Didn’t I warn you? It was going to be a long one. 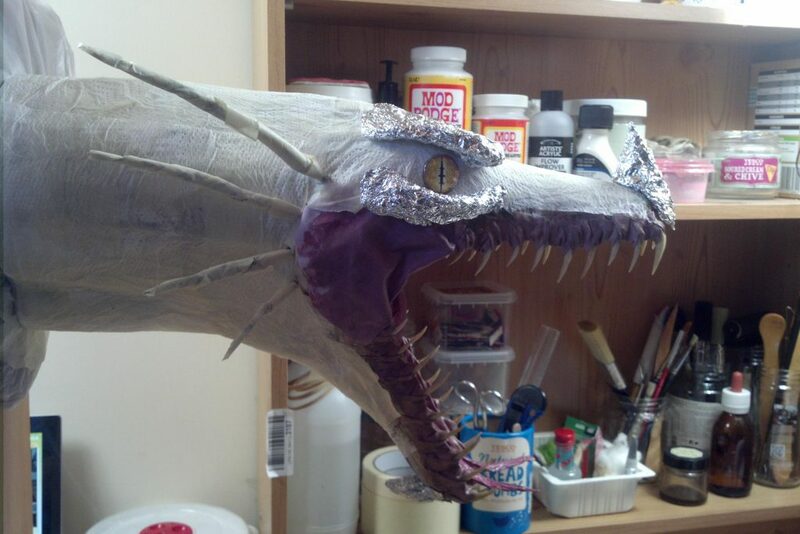 It may not look like much, but making the mouth of a dragon trophy head is about 1/4 – 1/5 or so of the total progress, so what you see here is about a week’s worth of work. Anyway, I hope you enjoyed it. I’ll keep you posted!